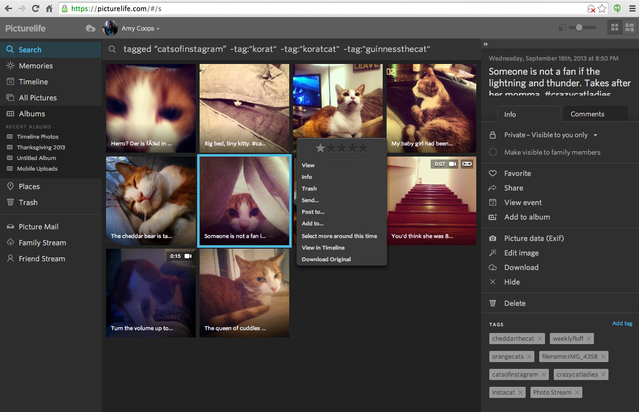 Search tool is super powerful and great for finding, organizing, and sharing your favorite photos, videos, and albums. Click on the most appropriate drop-down search term suggestions that appear below the search bar once you start typing. Below is a list of the most common search attributes and how to use them. Go ahead give it a try - the best way to learn is to test it out! Search Example: taken_at_date:[2004 TO 2008] - will return all media in your Picturelife library with a taken at date between 2004 and 2008. Search Example: in the album Summer Festivals 2012 will return all media that are in the album labeled "Summer Festivals 2012"
Another example: Search for all photos tagged "cat" and exclude all photos tagged "dog"
Search Example: First search: tagged "cat" ---- on TOP of this search (do not remove any text from the search bar) add -tag:"dogs"
You can, in theory, add as many exclusions to the search as you like. PLEASE NOTE: this search key is NOT currently working for photos uploaded after August 4th 2014. It does work for photos uploaded before that date. We'll update this article once original_file_path search is back online for newer uploads. Search Example: original_file_path:"/Users/Amy/Pictures/Chicago Summer 2012/"
We do not recommend using original_file_path as a search attribute for iPhoto & Aperture users uploads. Instead, search for photos originally stored in your iPhoto or Aperture libraries by original_file_name, date, event name, or album name. Notes: The search is CASE SENSITIVE and requires "quotation marks" around the local file path when you run the search. The search will return all photos that were uploaded from that path, including photos uploaded from subfolders along that path. For example, my MAC pictures folder called "Chicago Summer 2012" contains three subfolders on my computer - "Lollapalooza", "Boating", and "BBQs". The search I used in the above example returns pictures that were stored in those subfolders when I originally uploaded them to my Picturelife account. I've been trying to use the original_file_path selector and I've been getting some weird behavior. If I use the query: original_file_path:"G:\" I get back about 1200 photos. But if I do "G:\pictures\" I get back something I get back 8700. It seems like the more specific I am with the path, the more images it returns. This seems like a bug, however I've only now just started understanding the full power of the search and it is amazing, so thank you! One question, is there any way to find out all of the quereyable attributes and/or values? The suggestions are great, but I feel like I have to go fishing around to see what's possible. I think the G:\ will only return photos stored at the top level folders in the G drive, but the G:\pictures\ goes one level deeper. I'll confirm this with our Search guru when he's back in the office (he's out this week). I'm writing up a few more suggestions for search right now, in a new article. That said, the best way to get to know search really is to play around with it and find what works best for you!